Japanese chef knives are known for their high-quality design and the skill that goes into crafting them. The best japanese chef knives offer impeccable balance, and a razor sharp blade forged with the highest quality Japanese steel. Master Japanese blacksmiths, who spent years mastering the Samurai sword, passed down those same techniques that are now used to create a modern chefs knife. Above all, these knives are known for their unmatched sharpness. One major difference between Japanese knives and their Western counterparts is their size. They tend to be slimmer and tapered by design, which means they’re lighter, too. If you’re used to a traditional Western knife, you may be unsure of what separates the best Japanese knives from the average ones. No worries, as we’ve provided a Top 6 guide to make your shopping much easier. This Kasumi chef knife earns our top spot because it epitomizes the classic Japanese technique of sword making. It’s very sharp, with high carbon stainless steel that’s repeatedly folded during forging to create the classic Damascus pattern. The black laminated handle looks sleek, and it balances evenly with the blade. 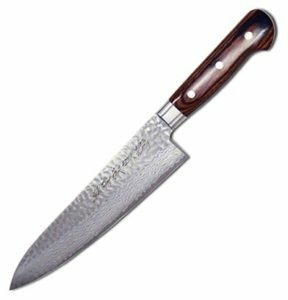 Kasumi Japanese Chef’s Knife – While we ranked the Kasumi number one on our best Japanese chef knives list, it’s not the most expensive, but truth be told, the cost difference between this knife and others on the list is not very much. When you consider the high level of craftsmanship and the reliability of the Kasumi name, you can’t go wrong with this knife. 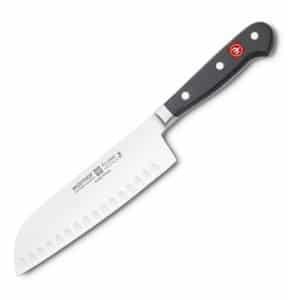 The Wusthof Classic is a top pick for home chefs because of its above average performance and smaller price tag. Wusthof is a German company, and this Japanese styled blade does have a few European influences. It’s a santoku style blade, so it’s great for thin slicing, but it has the heft for heavy duty jobs as well. The handle provides enough weight to balance nicely with the German steel blade. Wusthof Classic 17cm Oriental Cooks Knife – We counted this as one of the best knives on our top 6 list because it will fit in nearly anyone’s budget. It’s the least expensive, but you wouldn’t know by looking at it. Many chefs will be impressed by its looks, and be even more happy with how well this knife cuts. This kitchen knife by well-renowned knife maker Mac is a premium example of a Santoku. The 6 ½ inch blade is razor sharp, and the handle is appropriately weighted. Plus, there’s a bolster for extra balance. 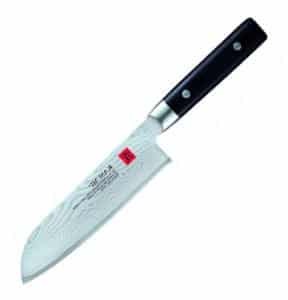 Cook’s Illustrated Magazine recommends this blade, so it’s one of the more popular chef knives available. Mac Santoku Knife W/Bolster – This is a world-class knife and the price reflects that, as this is the most expensive in our guide. With that being said, these is a chefs knife that will maintain it’s sharpness very well with minimal sharpening required. Out of all of the knives reviewed, this one stands out with its traditional design and classic appearance. It’s forged with VG 10 stainless steel and 33 layers of Damascus, giving it a Samurai sword attitude. The red sandalwood is a nice touch alongside the bolster. SETO Damascus Forged Steel Knife – This is one of the less pricey options, which is one reason that makes this blade worth considering. What makes this one of the best knives on offer, is the high quality blade, forged with traditional methods. It cuts as well as knives that cost considerably more. 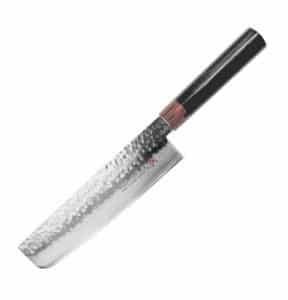 This Japanese chefs knife made by Sane Tatsu can perform just as well in a commercial kitchen as it can in your home. It has a very sturdy, triple-riveted mahogany handle, that’s laminated for protection and grip. The blade is sturdy too, strengthened by 16 layers of Damascus. The hammered finish also helps prevent stains and food slices from sticking. SANE TATSU Pro Chef Knife – The Sane Tatsu sits right in the middle of pricing, and that’s a fair spot. This blade does have a few features that let it fit in with higher end models, like the beautiful blade and the eye-catching mahogany handle. It’s fairly priced for a well built, good looking knife. As per Global standards, the G-48 is as impressive looking as it is sharp. The blade is fluted, leaving small indentations along the blade, creates air pockets that help prevent food from sticking. You’ll also notice at first glance the stainless steel handle. The handle is dimpled and molded, providing a secure and comfortable grip. 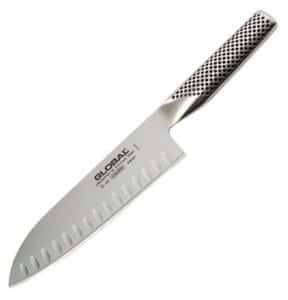 Global G-48 18cm Fluted Santoku Slicer- The Global G-48 is correctly priced, right in the mid range. It does a few things very well – it’s ideal for thin, precise slices. It’s not the greatest all round kitchen knife, but it’s an acceptable investment for most chefs and deserves a spot on the this list. Starting in the 8th Century, the making of the Samurai Sword, or Katana, or forging it and the Japanese craftsmen did was one of the most noble and extinguished positions available in Japan. Chef knives were not looked at as an art, or as something worth dwelling upon. 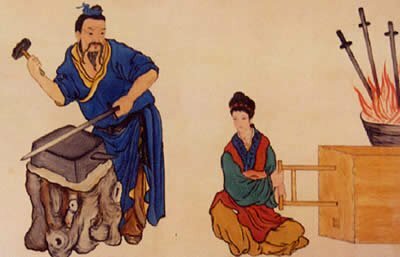 The art of sword making went on until the 16th century. When the Meiji restoration era started, the caring of Samurai swords was not allowed as a sign for the modernization of Japan. Even though there was some demand for swords for the army, most Katana artists, turned to forging blades for the tobacco industry. The same swordsmiths that for generations produced the Samurai sword, turned to making the first Japanese chef knife. Production of this new cooking knife using the same forging procedures that produced the best carbon steel blades for centuries in the Samurai swords, or Katana, was making headlines across the Far East. The Japanese knife became the most sought after and admired knife for cooks. With prices equaling up to a years salary. After WWII, the Japanese blade forging industry turned to making European style blades, as the demand grew form the new world, starting with the Santoku, which is derived from the Gyuto knife (or Gyutou Knife) which is another name for the French Chef Knife. Even today, Japanese knives are renowned around the world as having the best carbon steel metal combination for cooking knives. 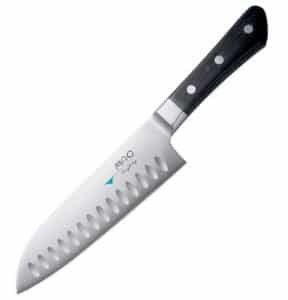 Today prices are more common, and you can get a good Japanese chef knife for less then £150. When the term Forged Blade, or Forged Chef Knife is used, it immediately makes people think of the Samurai Katana swords of Japan. The blade smith heats the steel ingot (block), usually it will be some sort of Carbon, Cobalt steel. It is heated up close to its melting point, so the steel becomes soft. Then it is hammered to the shape of the blade, being a chef knife blade, or sword blade, or pocket knife or any other knife. Not any forged metal will make it strong. The steel compound that is forged, shaped and sharpened has a huge importance to the final density and durability of the blade. In the 13th century, when blade forging was used to form the most revered and sought after Katana (Samurai Sword). The Japanese sword smiths experimented with several kinds of steel compounds to achieve the highest strength and flexibility for their knives. 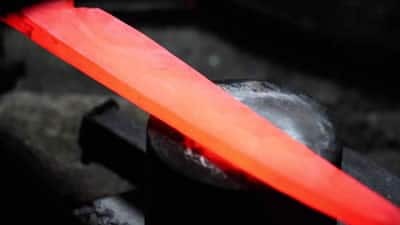 After countless steel compounds were tested and forged, finally, the most skilled sword smiths settled on a compound which is used up to this day for the making of Japanese forged knives. These Carbon Steel compounds include Chromium, Vanadium, Molybdenum and Cobalt. The Carbon Steel metal used today is called VG-10. VG-10 carbon steel is so precious to the Japanese culture, that the Japanese government does not allow it to be exported as raw material. Chef knife blades forged with VG-10 Steel are always made in Japan, and only exported after it is forged there. 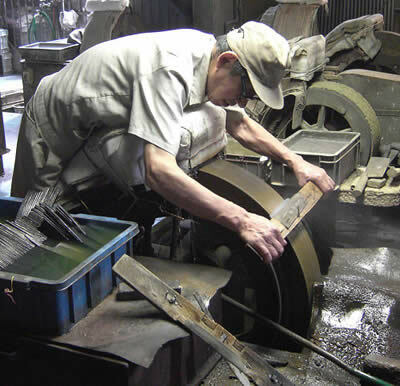 The second part of the Japanese forged blade, is folding the Carbon Steel metal while hammering it. This gives layers to the blade allowing for extreme strength and flexibility. The best Katana Samurai blades, were folded up to 800 times, making them extremely expensive and very sought after in the far east, and later on in Europe. Folding Carbon steel into a blade while forging it, takes a lot of time and experience. That is why a good Japanese forged chef knife cost range from a few hundred dollars and go up to several thousand dollars. Each fold made on the blade, adds steel fiber layers by 2 to the factor of the number of folds. Each fiber gives the blade a higher flexibility factor and more strength. Todays forged Japanese chef knives usually has between 16 to 32 Layers. The better knives have 67 layers and up to 960 layers. We rate the Kasumi Japanese Chefs Knife as the best knife we have reviewed and it rightly takes our top spot in the product test. Why? In terms of quality, it is superb in every detail, from the blade manufacturing techniques to produce an incredibly sharp knife, to the handle which is perfect for a commercial chef – it’s comfortable in hand, and the laminated Pakkawood provides an excellent grip under any condition. Plus, it’s balanced enough to minimize the strain on your wrist. Overall, an excellent knife that is a joy to use occasionally at home or all day long in a professional kitchen. Honourable mention – The Kasumi takes our top spot and rightly so, but, if you are looking for a great knife to use at home, take a look at the Wusthof Classic 17cm Oriental Cooks Knife, at nearly 1/3 of the price of the Kasumi it really does deliver bang for your £/$. However, that being said. If you choose any of the knives in our top Japanese chef knives list, you will not be disappointed, they are all terrific knives in their own rights. Our review criteria is based on knife quality, ease of use and price. All of these knives offer a great balance of those criteria and we would be delighted to use any of them in our kitchens at home or at work. Whatever you choose, enjoy!